I haven't played a Double Fine game in years, but their documentaries and Let's Plays are magnificent things, revealing design insights about not just their own titles, but about games including Symphony of the Night, Earthbound and Doom. Their particularly excellent Devs Play series has returned for a second season, and now that a PC game has been featured, it seems a good time to bring it to your attention. 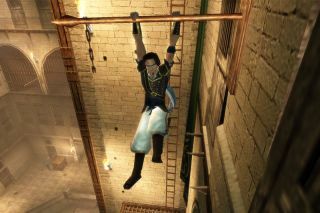 If you click on the video above, you can watch Assassin's Creed creator Patrice Désilets talk about Prince of Persia: The Sands of Time, a game he worked on during his time at Ubisoft. Patrice came up with the game's winning rewind mechanic, something he chats about during the hour-long video. When you're done (by the way, have you watched Double Fine's Psychonauts documentary series yet? ), you could also check out the first two episodes of Devs Play season 2, dedicated to Spyro and Ratchet and Clank respectively. Or: queue 'em up for Christmas, then slink off to watch some Double Fine docs when Mum and Dad are engrossed in Mrs Brown's Boys or Downton.